Explosionade is out now for only 80 MS Points! Check out the free trial! Microsoft has fixed the dashboard at least for the moment and Top Downloads is working (as of October 6th, 2010). Unfortunately in the past, after the list is fixed, it often breaks again in a few months, without warning. Microsoft has offered no public explanation to developers or any assurance they've fixed it with any more certainty this time. On the Xbox 360's Dashboard, there are many digital marketplaces from which you can download games. If you go to the Indie Games section you'll see several game lists including New Arrivals and Top Downloads. New Arrivals shows the most recent 20 Xbox Live Indie Games uploaded to the service. As the name implies, Top Downloads shows the 20 games that are currently downloaded most. Think of Top Downloads as "Most Popular". The Top Downloads list is powered by the sales and trial data compiled by Microsoft from the day prior. So for instance, if today is October 3rd, typically sales data would be available for October 2nd some time in the afternoon. Top Downloads always should reflect gamers choices the day before. 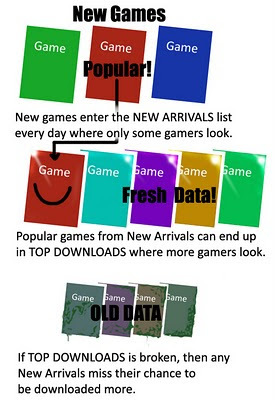 That way, if a new game enters the New Arrivals list, then by the next day, if it has lots of gamers checking it out, it will also be in the Top Downloads list. There are currently over 1,300 games available on the XBL Indie Games channel. 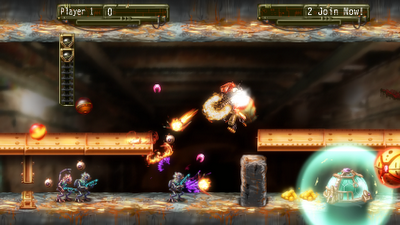 Several games are released each day. Often times a game will only spend a few days in the New Arrivals list. If it hasn't garnered enough attention, it will slip off that visual list, and buried in the "Browse All" list where only the most determined gamers will seek it out. Why Aren't You Releasing Explosionade Yet? If we released Explosionade today, but the Top Downloads list is not updating properly we will miss a huge chance for more sales.We love making games as a full time business. If we have a bad launch for Explosionade, it will greatly hurt our potential to carry on. 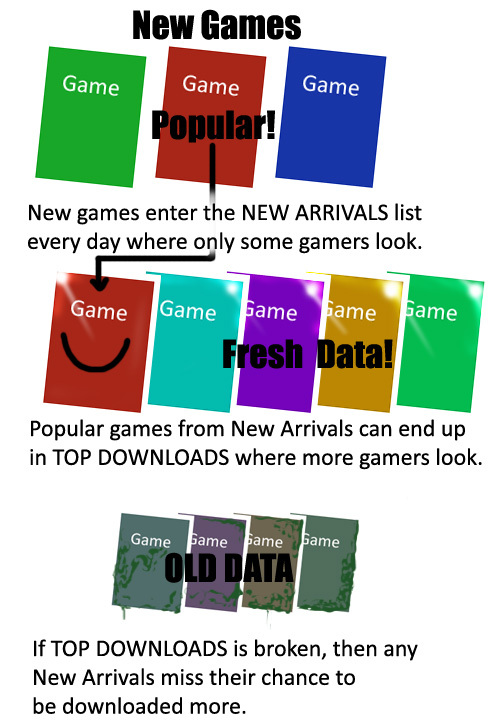 Basically the way the NewArrivals/Top Downloads system works is more adventurous gamers sift through all the releases that enter the New Arrivals list. Some of these games get downloaded by more gamers than others. If a game gets downloaded enough, it will show up in the Top Downloads list. From having data from Weapon of Choice, Shoot 1UP, and from talking to other XBLIG developers it's apparent having a game in the Top Downloads list can get you many more trials than slipping off all easy-to-find lists. When Top Downloads is stuck, it's true some games are high in the list and get more downloads then. But eventually gamers will recognize the list is stuck (when sometimes data doesn't update for over a week) and gamers begin to ignore the channel more as it's obvious something's broken. Even though some games initially benefit from the list being stuck, eventually all games suffer from lower traffic. How Do You Know the Top Downloads List Is Broken? One way is to simply check the Top Downloads list itself on the Xbox each day and see if the Top 20 are identical. That's pretty tedious to do, so if you are an XBLIG developer with a released game, you can simply check your sales data for any of your games and see if it reports data from the day prior. For instance, it's 11pm EST on October 3rd, but sales data for both Weapon of Choice and Shoot 1UP is only up to date till October 1st. The sales data drives the Top Downloads list. If sales data is late, the list is not updating. If you don't have any games released you can follow Mommy's Best Games on twitter or others, or check the XNA forums. Also, I publicly share sales data for Shoot 1UP from which I hope other developers can glean some marketing strategies and understand the XBLIG marketplace better. 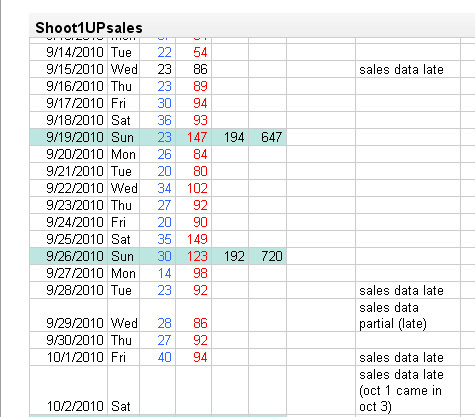 I also try to mark every time sales data is late in the Shoot 1UP spreadsheet (over to the right of the date). To the right, you can see days data was late, or partial, which translates to a broken Top Downloads list. Any interest gamers showed for these game is lost until the list updates again. If we had released Explosionade yesterday, it would be missing potential time in the Top Downloads list and potential sales. So When Are You Releasing Explosionade? Sales data has been spotty since September 28th, which means the Top Downloads list has been spotty in terms of reflecting gamers interests. In months past, the Top Downloads list has stayed stuck for days, sometimes over a week. I really want to release Explosionade, as I publicly announced we could release by October 4th (Monday). It was ready in time for review earlier this weekend, but I've been waiting till Top Downloads is functioning properly. Explosionade in all it's alien-stomping glory. I'm hoping the list will start updating again properly by Monday evening. If it is, I'll put Explosionade into review, and if the game passes review, it will probably be available Thursday morning, October 7th. Above all, I really love the freedom the Xbox Live Indie Games channel affords developers to make console games. It's a fantastic marketplace that has really come into it's own with stand out titles like I MAED A GAM3 W1TH Z0MB1ES!! !1, Miner Dig Deep, Breath of Death VII, Protect Me Knight, SoulCaster, Inferno, Decimation X, and many more. I love developing games for the XBLIG when the system works and I want the service to continue. But if Top Downloads keeps getting stuck it's going to eventually impact developers and gamers and the channel will suffer. The story was covered here on eurogamer.net. Here and around the web, some questions were presented I thought I'd explain with the original article. "Why don't you just release it after the dashboard is working?" Currently to submit a game to XBLIG it has to enter peer review. This system has worked very well as over 1,300 games have been submitted with a very low percentage of crashes. But to pass through the review it takes several days. At any given point the dashboard could break--even right when it's out of your hands and shows up freshly on the list. There's no developer control here, it's all up to Microsoft to fix the the broken dashboard. "Who's to say you'll be in the top list?" I'm not saying Explosionade will automatically be in the Top Downloads, it's more that the possibility of getting into that list is basically removed completely for our game and anyone else releasing a game when the dashboard is broken. The system breaks down for new releases' potential when Top Downloads is stuck. "But it only happens every month or two, what's the big deal?" Any breaking is too often. A digital distribution system lives dies by it's useability and the reflection of current traffic. Look at any good website or marketplace from CNN to YouTube to Gamespot. There is always a section of 'most popular' which needs real-time data to survive and where most people go first. If this most popular section is broken, sites and markets lose traffic. As I mentioned earlier, once the game is released the developer has no control over it. If the list is broken, they will lose traffic and possible sales. Its like a puzzle and arcade game i like play this game. Thanks for share this nice post about it. Nathan, I'm a sucker for your games - not in a bad way. I love playing them. You'll have my 80 points whenever Explosionade is released. It must have been a tough call to delay the release, hopefully some coverage on the issue will prompt MS to fix it! Glad you like puzzles and arcade games. Good luck with those logos. Excellent! I hope you enjoy it, we worked extra hard to make it great. Yeah, it's kind of gut-wrenching as we're fortunate enough to get some press before the release but now have to delay the game because of technical issues that are out of our hands. So release he game on STEAM. Definitely a better service than XBLA. The game looks like crap anyways. We have enough bad games on XBL Arcade, thanks. Sorry to hear everything's so crappy. Have a Fresca! Yes, STEAM is good for PC development but we're more interested in console development. Though we will be doing some PC development down the road. Awesome! Glad you're excited about it, we are too. Can't wait to see your gamertag high on the global high scores! "the developer has not control over it"
Now You made me afraid of the in game grammar. You are not going to get anywhere close to the top download positions with this game, so delaying makes no sense. >Now You made me afraid of the in >game grammar. Ah! Good find, I fixed that thanks. And I'm not the dialog writer, he's much gooder at grammar. >You are not going to get anywhere >close to the top download positions >with this game, so delaying makes >no sense. I know! It's tough to get into Top Downloads. I hope you'll tell all your friends about Explosionade though to help out. That'd be great--thanks! I've been a fan of your games since Weapon of Choice came out, bought it when it was still 5 dollars. I'll be picking both Shoot1up and Explosionade once Explosionade comes out, great stuff man. I'll be picking up Grapple Buggy whenever that comes out as well. Kepp it up, You guys are among my favorite indie developers. Nathan is being too kind with haters, in my opinion. excited to see you ship the game. what's the latest on your target ship date? > Nathan is being too kind with haters, in my opinion. I think he has handled it very well, not fueling them nor breaking his mood. Why all the hate to begin with? Making this kind of game is no easy task, and as an indie developer it becomes a one man army task, unlike infinitely big companies with hunders of programmers, artists, admins, QA guys, etc. Besides, this game is looking good! I got hooked by the guitar riffs with the weird drums on the trailer! The game is finished and released, everyone (@Kitty in particular). Can't wait to see a play through video of this on you tube. Thanks for the very very information and quality of our web site. think he has handled it very well, not fueling them nor breaking his mood. I have really learned a lot from this blog today. I will check back again from time to time to see if it has been updated. Really great article, found the tips very useful. I like your writing style, you break it down very nicely and your blog is very attractive. Great Stuff! Physical appearance,Monster surpasses by yourself, and almost exactly the exact same since previously generation- creature beats business, just a spend involving chemical far better http://monsters2012.blogspot.com/. we've use the white colored model.your incorporation of design and style, is better than facilities purpletype associated with incomplete eliptical involving buddies brain might actually really feel a little toss. Hearing for you to ear canal 50 % the pack design, some people will experience 100 % cotton reduce inside the ear problems http://bydre2012.blogspot.com/, nevertheless for most people will certainly are around the particular ear, show up insulating material and luxury may be good. It's not that I detest cats; it is actually quite We hate felines making noise whenever I'm attempting to catnap. Cats are exceptional creatures. Typically, these types of cats generator around through the day at the same time as refuse to pierce the day time as well as any fracas. I appreciate them. As you say, shorter and crispier contents catch the eyes of readers.But at times one needs to be elaborate while sharing their own experiences which may be of great use to those who read them. It must be a difficult decided to postpone the release, hope on this issue, some reports to MS repair it! Your blog is interesting and helpful too. Keep it up! 8 Bit Horse is One Year Old!